Other information – Vid. Kunigal Ramashastri was a highly respected scholar in the court of Mummadi Krishnaraja Wodeyar. He was also known as Edatore Ramashastri, Mysore Ramashastri and Shatakoti Ramashastri. He was a very popular teacher of advanced texts of Tarkashaastra in Mysore. He had students from far-off regions of Andhra and Tamil Nadu also. 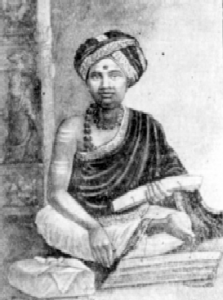 He had undertaken a tour of South India, and conquered many reputed scholars in Vaakyaarthas related to Tarkashaastra. Scholars from Navadveep, Kashi, Darbhanga, Prayaga, etc came to Mysore to study his texts and spread them in the North.